Once the best-kept secret of the dance community, Pilates has been discovered and embraced by singers, models, athletes, actors and wait for it….normal people!! But what exactly is Pilates about…especially Clinical Pilates? If you define core stability purely in terms of ‘strength’ (such as it is used in the fitness industry and in large group Fitness Pilates) and limit it to being region specific (i.e. trunk musculature only), then the myth of core stability is rampant. Tighten all of your ‘trunk’ muscles and notice how you feel and how your movement is. For most people it feels limiting and stiff. Any good Phyisotherapist will tell you that the body works as an integrated whole and holding a plank for 5 minutes will not cure nor prevent back pain brought on by 1 hour of sitting! Clinical Pilates is largely concerned with training local spinal and pelvic stabilising muscles to work efficiently throughout functional activity. Clinical Pilates seems to have filled the gap between moving away from “hands-on” manual treatment to addressing the neuromuscular system associated with the onset, persistence and reoccurrence of pain. Because of the nature of Clinical Pilates it is seen as being particularly important for people with spinal pain amongst other motor control problems and is associated to what researcher’s term “specific stabilisation exercises” or “motor control exercise. 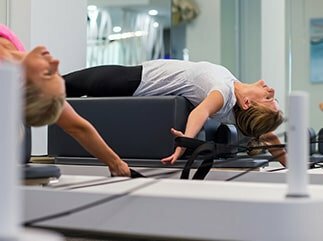 Clinical Pilates has become an important tool for many Physiotherapists in answer to the spinal stability research that has surfaced over the past decade. Whilst the foundation stone of the Pilates is the concept of core stability. A stable trunk, or mid-section, is the best platform from which to develop whole-body muscular strength and endurance (durability), balance and flexibility. Having a stable ‘centre’ allows one to move efficiently with good technique. It should minimise tissue overload, correct alignment and muscle imbalances and therefore reduce injury risk. Pilates’ balanced approach ensures that no muscle group is overworked; the body operates as an efficient system in sport and daily activity. Hence, muscle and joint stability is the key prerequisite for the efficient development of muscle flexibility and durability. And the principles and equipment of Clinical Pilates help to achieve this better than most, if not all, other exercise systems. In an effort to grow rapidly as an industry, Fitness Pilates is in danger of becoming its own worst enemy. 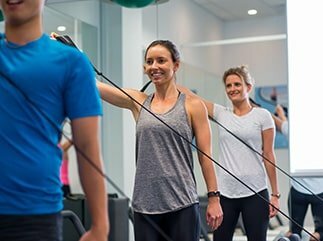 I speak from experience: working as a physiotherapist in the sports and fitness industry, I hear weekly about the injuries created in Pilates classes by well-meaning instructors with upwards of 30 people in their care. The most common complaint is low-back pain related to forward bending (flexion). An example of this is an inflamed disc that creates pain and prevents full forward flexibility. Sitting becomes painful, and bending over or lifting can be even worse. The last thing hat is going to help this sort of pan is loading it repeatedly in a flexed position with exercises that are uncontrolled and more often than not too hard. Something very common in large group classes. The key to getting the most out of your Pilates is having a great instructor. And the key to being a great instructor are accuracy and specificity. Accuracy relates to how Pilates is taught: the type of exercises and the context. The success of the system relies heavily on the careful education and monitoring of a client by a correctly trained teacher. The question must be asked: does the advantage of teaching 30 clients in a class outweigh the disadvantages of 50 per cent to 90 per cent of those participants getting it wrong? From experience, I know that it can take up to 30 minutes of one-to-one attention and direction from me before a patient learns to isolate and activate the correct muscles for even one new movement pattern. And then they have to practise it! One-to-one training is the best medium and must remain the basic initial learning tool to learn to use the “core muscles” correctly. Small groups of no more than 4 or 5 is the next step. Specificity relates to what is being taught. We’re talking about the critical word in exercise philosophy here: you get what you train for. So, if you as a client are doing Pilates and strengthening the wrong abdominal muscle group, you will probably get good at tensing the wrong muscle, but never achieve correct stability. Or if you have not been shown correctly how to move around your pelvis in order to hold a neutral spine, your brain will learn an incorrect movement pattern and your body may be setting itself up for injury. The power of Pilates lies in the detail. The specificity and accuracy of Clinical Pilates make it such a potent tool for anyone interested in maintaining peak physical conditioning as well as a great rehabilitation instrument.